Martina Navratilova is an international Tennis Legend. A champion on and off the court, Martina is an inspirational leader who demonstrates tenacity, candor and sheer motivation. 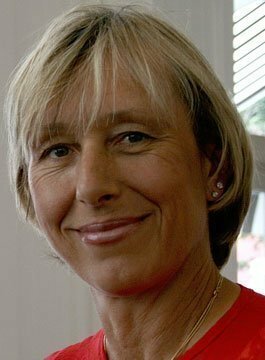 Arguably the best tennis player ever to step on the court, Martina Navratilova amassed an unmatched number of professional records over the course of her career that spanned an amazing four decades and was ranked #1 in the world for astonishing 331 weeks. She has won 59 Grand Slam crowns, including a record 9 Wimbledon single’s champions, and has overcome the odds to become both one of the greatest tennis champions and an equally successful leader. Off the court, she has served as the face of change in the United States and around the world. Her efforts in health & fitness and civil rights have helped her gain millions of fans outside the world of tennis. Martina Navratilova is a record-setting tennis champion, whose Grand Slams and achievements are some of the greatest in all of sports. As a result, she truly understands what it takes to become a champion. Whether you are an athlete, an artist, or a businessperson, she understands the dedication, perseverance, and commitment involved in being your best. Navratilova discusses the challenges and qualities necessary, and helps audiences become champions in their own fields. As a champion tennis player, Navratilova had to work to achieve goals, and is an expert in the process of setting realistic goals in order to achieve success. She discusses the strategies and outlook necessary to perform and live up to your own personal expectations, and helps audiences understand the necessary traits to successfully achieve goals. Martina Navratilova has faced many obstacles, from growing up in suppressive Czechoslovakia to life as a gay woman, and she understands the necessary attributes to successfully overcoming adversity and difficulties. As a result, she gives audiences insight and empowerment into overcoming any obstacle, and helps listeners face their challenges with bravery and strength. After years of maintaining her body at the top level for her athletic career, Navratilova knows quite a bit about maintaining a healthy lifestyle and being physically fit. As part of her new book, Shape Your Self, she helps explain to readers how they can achieve fitness, without sacrificing too much. In this lecture, she does the same, enlightening audiences on the importance of health, and how it can be achieved with simple steps and solutions. After playing professional tennis through the age of 50, Martina Navratilova has gone against the odds of aging. She discusses how the Baby Boom generation is redefining aging, and talks about important it is to accept aging, but also to redefine it in order to suit more active and fulfilling living. A lifelong believer in human rights for all – regardless of race, religion, and sexuality – Martina Navratilova is known as a great humanitarian who speaks out for those who cannot speak for themselves. She discusses the importance of equality and rights, and uses her own experiences to help expand knowledge and understanding of the fight for equality for all. A tennis legend and cultural icon Martina Navratilova provides corporate audiences with highly motivating and engaging presentations. In addition to sharing her secrets on the keys to winning, she demonstrates how anyone can overcome challenges and obstacles and achieve success through determination, right strategies, and hard work. Martina Navratilova is one of the most incredible athletes and cultural figures in recent history. Born in Czechoslovakia in 1956, Martina turned pro at age 16, quickly earning a spot among the game’s best players. Frustrated by restrictions on her freedom in the communist country, Navratilova took the bold step of seeking asylum in the United States at the age of 18. By 21, she’d won her first singles victory at Wimbledon. Driven by her dream to become the best tennis player in the world, she made yet another gutsy move, thoroughly revamping her approach to tennis with innovative forms of cross-training, fitness and diet. Navratilova dominated tennis in the 80’s, at one point winning a record-tying six straight Grand Slam singles events. Throughout her career, Navratilova won a record 354 professional titles (167 singles, 177 doubles, 10 mixed doubles.) She is the only player in tennis history to have won Grand Slam titles in four different decades (70s, 80s, 90s, 00s) as well as to have achieved the longest winning streak (74 matches in a row.) She is also one of only three players to have ever won the singles, doubles, and mixed doubles at all four Grand Slams. Martina was ranked as the best player in the world for seven years, earning her placement on Sports Illustrated’s “Top 40 Athletes of All Time” and an induction into the International Tennis Hall of Fame in 2000. In 2006, she yet again redefined what it means to be a true champion when she won her curtain-closing Grand Slam victory at the U.S. Open, just one month shy of her 50th birthday. Knowing first-hand what it takes to overcome adversity and find success, Martina is a compelling advocate for active living, strong determination and aggressive goal-setting. She has written books in both the fiction and non-fiction genres, including “Shape Your Self,” a guide to personal fitness and healthy living. These days, Navratilova also takes her articulate, intelligent and outspoken commentary beyond the speaker’s circuit, serving as a tennis analyst and commentator. Martina currently resides in Florida.